Anonymous devotee of Shirdi Sai Devotee from USA says : Since childhood I believe in Sai Baba so much and He has helped me numerous times. I am very happy to be part of this Mahaparayan group. How did I get into this group? I am part of a local whatsapp group and I hardly keep up with the messages in that group as there are too many messages to read, but used to check as and when I have time. One day, I opened that whatsapp group and saw about Mahaparayanan. Deep in my heart, I felt that Baba wants me to be part of this group and that's why He made me see that message. So, I joined the group and really enjoy every time I do the Mahaparayanan. Many times tears rolled out of my eyes while reading Baba’s stories. Shirdi Sai Devotee Manibala from India says : Om Sai Ram to my Sai Family, Iam from MP-142 group. I want to share an experience with you all, which had happened during Mahaparayan time on 11-02-2018. I had been to Pitapuram SriPada temple today(11th Feb). There I was truly blessed as Swamy asked me to give Bhiksha. I was distributing wheat flour Prasad to the people over there where I found a dog which was following me wherever I went. Shirdi Sai Devotee Manjula from India says : Om Sai Ram. I am Manjula from Chennai. I am a part of 365 days parayan, weekly parayan, Sai Sharan (i.e daily reading one chapter as a prayer ), Sai Koti, Thursday Sai Naam Jaap & I am reading Stavan Manjeri daily(but not in any group). Thank You Baba. Feeling Blessed to be a part of all these. I would like to share my life saving experience with you all. Yesterday(28th April 18) Me, my husband and our three children, we went to Kanchipuram temple to have a darshan of Kanchi Kamatchi. We had a great darshan of Amman (Maata Rani) with Baba's blessings. Daily I used to read Stavan Manjari, so yesterday in Kanchi temple also I read Stavan Manjari in front of Ambal (Maata Rani). While returning my husband stopped the car by road side to ask for the route. By that time a MTC transport bus hit our car. We all were sitting inside the car but by the the grace and blessings of our beloved Baba nothing happened to us. Only our car got damaged. I forget to tell you all that before starting from home I prayed Baba for the safe journey and applied Udi to all of us. Baba's blessings and Udi have saved us. Why I am sharing this experience with all because Baba loves His devotees more than anybody in this world. He is our real Protector. Those who believe Him will be saved by Him in any situation . Om Sri Sairam. Baba will not allow His devotees to come to any harm- One of the promises of Sai Baba. Udi also takes up the form as per our bhaav; be it a Doctor, Healer, Teacher or our Protector too. Thanks Baba for the wonderful gift of 'Udi -The Panacea' to Your devotees and thanks to Das Ganu for composing Stavan Manjari and getting it blessed from You. Ever indebted to You Sai. Jai Jai Ho Sai. Anonymous Shirdi Sai Devotee From USA Says : My humble pranams at Your lotus feet Sai. With Bhagawan’s grace, I have been a part of Mahaparayan and there are countless miracles. This life is a grace of Sai and whatever happens is all His grace. I would try my best to narrate some of the experiences which will be a booster of faith and patience in all the devotees. Infact, this body took a birth because of His will, this body is functioning well because of Sai, the nature I see around is His creations, and the basic living life style are all His blessings, whatever is happening either small or big accomplishment is all His mercy. Still, I would try to be short and narrate few of those instances. Devotees, through my last sharing, I mentioned how our car was damaged and with Baba’s grace, we upgraded a new car (white in color). Sai called us to His mandir and we were able to take His darshan and we did our vehicle puja in Shirdi Sai mandir. Baba always wore white kafni in His lifetime and therefore, I think Baba wanted us to select a white SUV. Thank You Sai. Within a week, Baba helped us to get our money from the insurance and He helped us to get a new vehicle. I was really confused whether to repair the car or to get a new car. 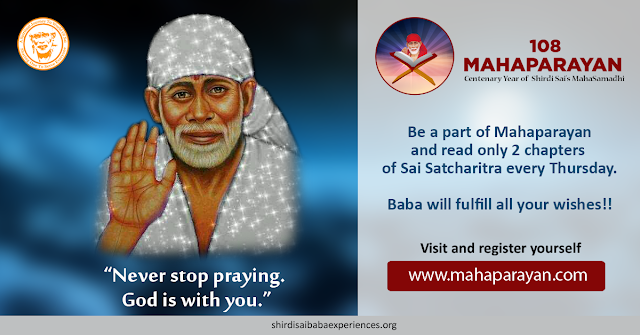 Shirdi Sai Devotee Sai Shruthi from India says : Sairam Everyone, I am from MP-56 group. Want to share a miracle which happened two weeks before. I was in office and my team was taken to training room and it was a session period of Two and a half hours. Once we entered the training room we should not go out until the training gets completed. That day before going to office I ate boondi with curd, after eating I felt it tasted something different but I didn't pay much attention. I went to office and after a time span of 4 hours we went to training. After 5 minutes in training I started to get stomach pain abnormally, and I was sweating, unable to breathe properly and the pain was heavy. After 10 minutes it became more and I couldn't even move a bit, it was like all the intestines in my stomach became hard or felt like someone was pulling them out and the pain was horrible. Shirdi Sai Devotee Manibala from India says : Sai Ram everyone, I am from MP-142 group. I want to share 2 miracles that had happened to me. I am a part of Sai Anugraha orphanages, old age homes which is a Global Wide Organization. A person named Kishore who lives in USA organises this Sai Anugraha. Now coming to my couple of experiences. Since nearly 10 days (i.e from 21-01-2018) I was followed by a dream about Sai Baba and Sai Anugraha orphanages - old age homes daily in my dream. I was saying about these all activities to everyone and discussing all these with Kishore Ji and his father in my dream daily. I was just wondering why this particular dream gets repeated daily. Yesterday I said about my dream to Kishore Ji and he said that "Actually we thought to make a team (Volunteers) in kakinada for Manaspurthi (Sai Anugraha) orphanage, later on I got shifted to Hyderabad regarding job and I forgot all about it". And I would read my allotted chapters for Thursdays as I am a part of Sai Satcharitra 108 Maha parayan. As I wasn't having Sai Satcharitra book so normally I was reading through Sai Satcharitra Mobile app. At last of every chapter there will be a message. On 25th January I had completed reading of 37th chapter and saw a message at last of chapter 37, i.e *Fulfil your promises that you made for Baba*. Seriously I thought much but I didn't get the answer that which promises I've made to Baba. And I requested Baba to give me some hint regarding the promise that night. After all this heard by Kishore ji, he said "Yes, this is the promise that you've made to Baba to form a team in Kakinada and daily He was appearing in your dream and reminding about Sai Anugraha children". 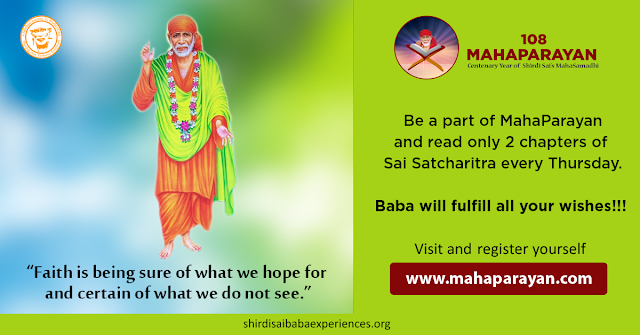 Felt so blessed that Baba reminded me after reading Sai Satcharitra. 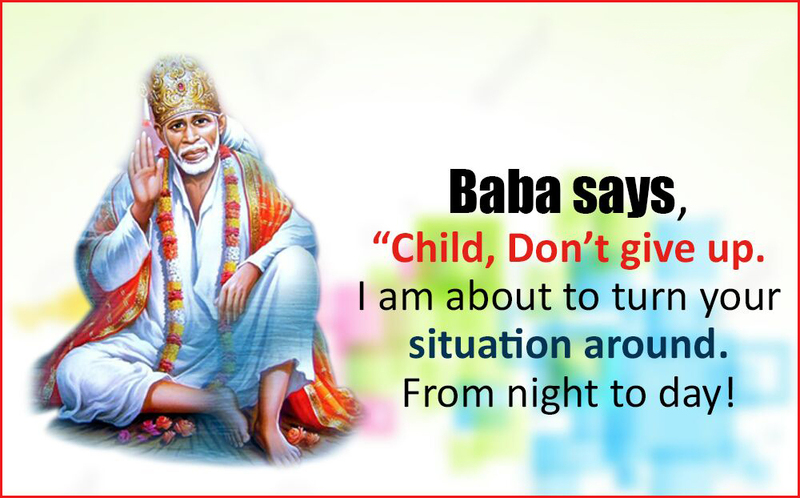 And Baba is aware of all the things and our promises, overall Baba is Omniscient. Secondly, today I had a dream of Sai's temple where the construction was going on. I saw a white crystal clear Sai baba's Moorthi and on the left side of the temple outside I saw a Sita-Rama,Lakshmana and Hanuman ji's black statue which was just straight away from Baba's moorthi. I also saw Baba's Silver padukas which were enclosed within a glass. The temple was full of crowd and I leaned on the wall side placing on my hand on a glassy table. There I found Baba's Wooden padukas. When I discussed all these with kishore Ji He said me that *Actually today i.e., 27.01.2018 they were going to start a Baba's Mandir construction in MANCHESTER* and the construction plan was exactly the same way that which I had dreamt like Sita-Rama statues will also be going to placed there and about Padukas too which would be installed there. I had got exactly the same dream which was a construction plan of SAI Baba temple in Manchester. What a great dream I had, Felt so glad to share this with you all. Om Sai Ram. 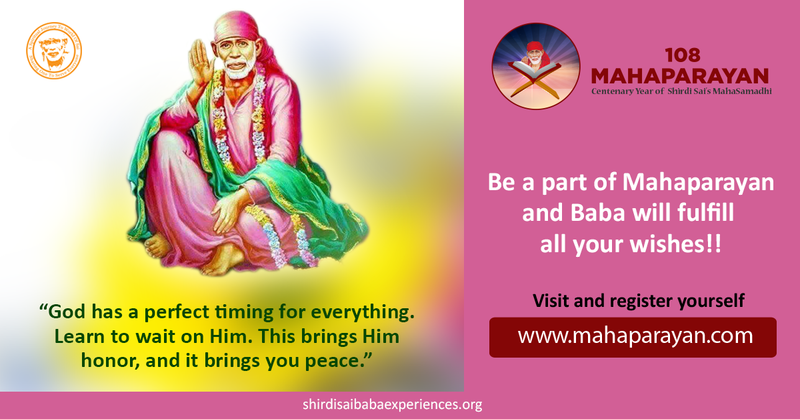 Baba appearing in our dream is not a mere coincidence, it’s His message that we need to decode and act upon immediately with full faith in Him. Our visit to Shirdi and Baba’s visit in our dreams are equally auspicious. Ever Indebted To You Baba, love You. Jai Jai Ho Sai. Anonymous devotee of Shirdi Sai Devotee from USA says : Sai Ram Devotees, My humble pranams at Bhagwan's lotus feet. Sai, let me perform this work of writing, being Your instrument to the best of my ability and offer at Your lotus feet. Sai, let me offer this doing to You. You are the doer. Devotees, what to say of Sai leelas? I get confused regarding what to include and what to omit. 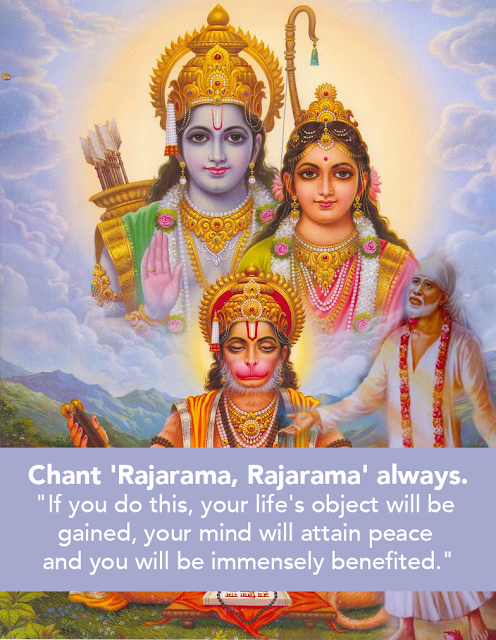 I am a devotee residing in US and Baba has chosen me to be a part of His Mahaparayan. My sincere thanks to Him. It is not that I registered and I am selected to be a part of it. It is Baba Who made me read the blog, who informed me about Mahaparayan and it is He who decides who will start MP on what time/what day. All is His divine plan. This life is something that He has already willed and planned and we just have to do our duty with strong faith in Him. I pray to Sai to give me immense faith so that I just keep spending my life through His name on my lips and service through my hands. Bless me Sai. Shirdi Sai Devotee Gunja from India says : Om Sai Ram, by Baba’s grace , I am a part of this wonderful group where I get to pray with thousands of devotees. I was able to be part of the group but my husband was not. My husband thought of an idea of creating a local Parayan group with people we know who would be interested in doing the parayan. By Baba’s blessings, we have group of 25 people and we have completed 28 Parayana thus far with by Baba’s blessings. I have read many experiences of devotees and I wondered and waited for Baba to show me a miracle. To show me that He is with me which I believe He is. Shirdi Sai Devotee Divya from India says : Om Sai Sri Sai Jaya Jaya Sai. My Khichdi Parayan Experience. It's been very long time I have not shared my experiences. I was busy with our groups and with Baba's Blessings all groups are going on successfully. 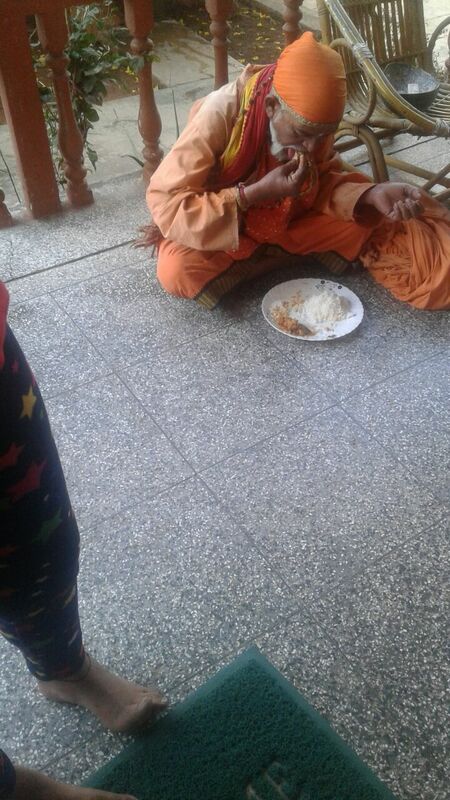 Today I would like to share how Baba loves to have food offered by His devotees when we make with love for Him. How He reminds us to make it . Main miracle starts here, two times I couldn't offer Khichdi as I went out to someone's place. As I mentioned earlier in my first post that we have 3 Parayan groups on Thursdays. Those two weeks when I didn't offer Khichdi , I had to read the Khichadi chapter of someone in our group (chapter 28, in which Baba eats Khichdi with love made by Burhanpore lady). Shirdi Sai Devotee Nikita Mallya from India says: Sai Ram. First of all I would like to thank you for providing such a beautiful opportunity to each and every devotee of Sri Sai Baba. I am an Engineering student. Now I am in my final semester. I believe in Sai Baba more than my parents. I used to do saptah twice a year and due to that I have gained a lot till now through the blessings of Baba in my life. Shirdi Sai Baba devotee Poulin P from India says: Sai Ram ji, this is how His play goes. I am in love. So as any other girls even I was worried whether our wedding would happen. I was a staunch devotee of lord Narayana. Don't know how but around Dec 2016 I was attracted towards Sai Ram. Then I wanted to keep Nav Guruvar Vrat but was not serious about it. Before this itself I asked permission with Lord Vishnu for our relationship only after I got His approval I accepted this relationship. Also a fortune teller who used to be our bank customer told that I would marry as per my wish only. So all this made me feel comfortable. But we used to fight often as he is very sensitive and I am very causal type. 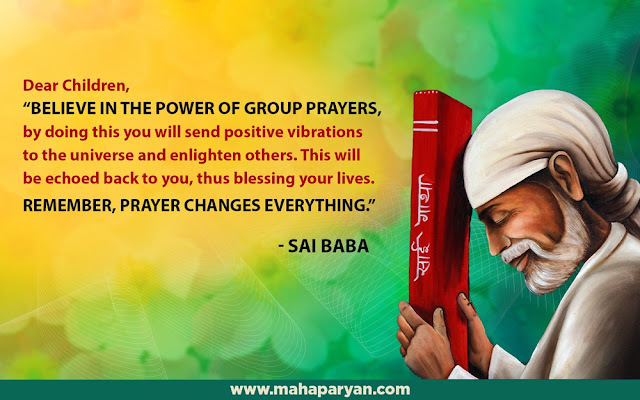 Anonymous devotee of Shirdi Sai Baba from India says: I am feeling very blessed to be part of Mahaparayan that it brought me so closer to Baba and also transforming my life. My heartfelt thanks to each and everyone who are working hard to make it successful. Only after MP, I heard about Das Ganu ji’s Stavan Manjari and the first time I read it, it was divine bliss. I still remember it very clearly. The way Das Ganu ji has penned down and praised Baba made a deep impression in my heart and my respect grew for Das Ganu ji. Only then I realised the statement that Baba is most pleased when His disciples are honoured. 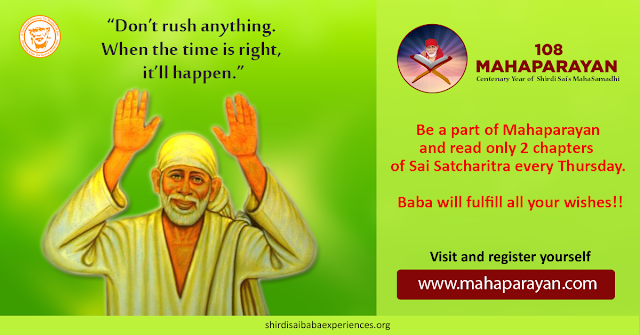 Shirdi Sai devotee Keerti from India says: Sairam dear Sai family, I am a part of MP-64 Amrita Sai group. I want to share a small but much needed miracle of Baba which happened just few minutes ago (i.e on 27th March). It's almost noon and time for my kids to return from school. They will be super hungry by the time they reach home as they don't eat in the morning and the snack is mostly not eaten. So, I make sure lunch is ready by 12 noon. Shirdi Sai devotee Shruti Bagaria from India says: Om Sai Ram. I am from MP-183 group. I would like to share couple of experiences which happened during Mahaparayan. Baba got my gold and diamond ring back. I took a ring from my mother, she told me that it was little loose for me hence told me to avoid wearing it.But I found it pretty so tightened it with red sacred thread and wore it for a month. Yesterday morning while going to the office I realised in the metro that the ring was not on my finger and felt sad as to why I insisted mom to allow me to wear. I prayed to Baba if possible where ever my ring has fallen, it would be nice if I get to see it before I reach the office as I would be able to concentrate on work. To my surprise, I found my ring in an unlocked drawer in my cubicle. Baba only kept it for me. Sai Nath Ki Jai Jai Jai Ho. Shirdi Sai Devotee Shubham Sharma from USA says: Dear Sai Bhaktas, from many days I have been thinking to share my experiences from the day I started Mahaparayan, finally penning down today. When I started parayana I kept hearing a voice quite often asking me to offer khichdi. I usually go to a nearby temple for volunteering but somehow from many months I was irregular in going to temple. Finally one Thursday I made up my mind and planned to offer khichdi at temple, but that day I got late and I was sure that they would put the curtain by the time I would reach temple, so I might miss to offer khichdi. I started from home for the temple, I was very nervous and was rushing. When I reached the temple, can you believe it, that day for some reasons there was delay in Arthi. Only after I had kept the khichadi in-front of Baba, the Arti started, as if they all were waiting only for me. This was His call and He made sure that I could offer Him. Shirdi Sai Devotee Nitii Seth from India says: Sairam all. I am Nitii Seth from New Delhi. I am from MPE-140 group. I would like to share my experience which had happened on 18 March 2018. On 18th March morning while I was giving bath to Baba's idol (i.e while doing Abhishekam), I saw Udi kind of powder on Baba's lap. I thought it might be dust. So I poured water and continued the Abhishekam to Baba. But later I realised that it can't be dust as I had cleaned my home temple on 17th night, then there is no chance of dust on Baba's lap on 18th morning. It was Udi for sure which I thought might be dust. Shirdi Sai Devotee Parvati Devi Meka from Canada says: I am from MP-89 group. 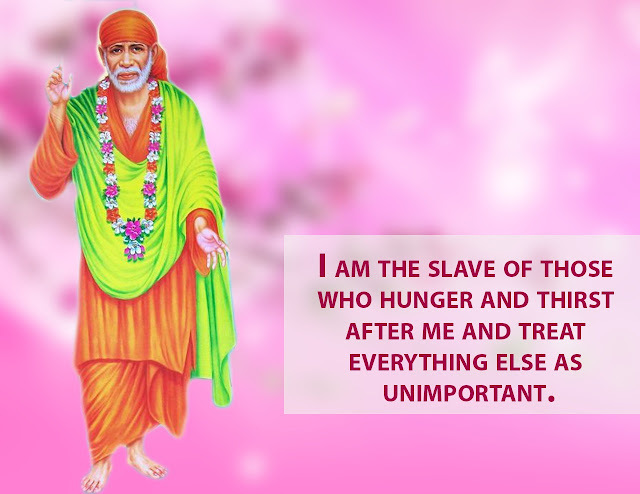 I am a Sai devotee for many years and experienced many of His miracles. We immigrated to Canada in 2001 and I was missing my family in India and felt so lonely, became more close to Baba and He is everything for me. I would like to share one of my recent experiences which happened during the time of Mahaparayan. My elder son and daughter-in- law are studying medicine and they are both going through the interview process for their fellowship. Both of their programs are highly competitive. My son was accepted into the program he was looking for and somehow my daughter-in-law did not. So she applied for a research fellowship in Cleveland and she was accepted but she didn't sign the contract. Shirdi Sai Devotee Ravali Satelli from US says: Sai Ram all devotees. I feel really blessed to be part of this Mahaparayan. I am from MP-166 group. I really appreciate and thank Pooja ji, Neha ji, Soumya ji, Hetal ji, Shireesha ji, Laveena ji for organising this Mahaparayan and they are really blessed and are chosen by Baba as His instruments to do all these works. I was thinking to start Sai Satcharitra parayan since many days ago but I could never do this before. One fine day my bhabi called me and told me regarding this Mahaparayan group and I was overwhelmed and joined the group immediately.